BlackRock, Inc. BLK intends to acquire 30% stake of Intesa SanPaolo’s asset management unit, per Reuters. According to sources familiar with the matter, BlackRock views the deal as an acquisition rather than an investment and it aims to extend its influence over the second-biggest fund house in Italy. Eurizon, which operates in Italy as well as Eastern Europe and Asia, has nearly €315 billion in assets under management (AUM). It is one of the most efficient asset managers in Europe and has a cost-income ratio of 20%. Over the past several months, Intesa has been looking for options for Eurizon and to do so, it has been working with UBS Group AG UBS, according to sources. Intesa’s plan has been to look for such deals with global asset managers, which would open more options for other smaller or similar-sized companies for partnerships. When in February, Intesa stated that it wishes to establish a partnership with an asset manager, its CEO, Carlo Messina informed that it is best to come to a decision as quickly as possible so that an agreement is reached upon by this year. However, recently, in Venice, Messina revealed that Intesa is still in the early stages to look for an investor in Eurizon. Notably, Intesa does not want to give up its control of the unit and hence, does not plan to sell more than 30% of Eurizon. However, if BlackRock acquires 30% stake of Eurizon, Intesa’s desire to establish accords with other partners is not going to be accomplished and those deals will only translate into commercial partnerships. Notably, since Intesa’s main source of revenues is from its asset management business, it targets to receive nearly €10 billion in fees in 2021, which would account for 48% of its total operating income. Being the largest asset manager in the United States, BlackRock’s main aim is to further enhance its technological capabilities. The company wants to integrate its global satellites onto its operating system Aladdin. With a strong global presence, broad product diversification, revenue mix and steadily improving AUM, its revenues are expected to improve further. Also, BlackRock’s investment in U.S. iShare core ETFs is expected to continue driving growth across a broader range of iShares precision exposures in the near term. Shares of the company have gained 22% in the past year, outperforming the industry’s rally of 8.7%. 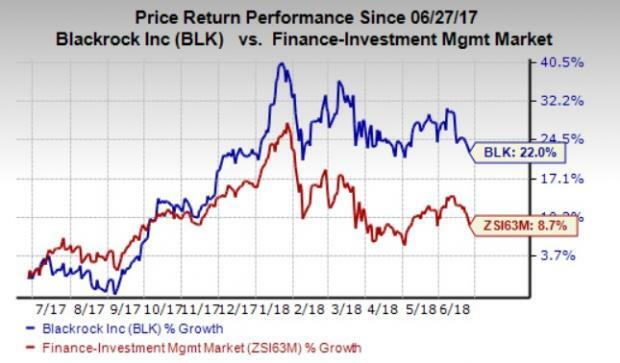 Currently, BlackRock carries a Zacks Rank #3 (Hold). A couple of better-ranked stocks in the finance space are Lazard Ltd LAZ and Comerica Incorporated CMA. Both currently carry a Zacks Rank #2 (Buy). You can see the complete list of today’s Zacks #1 Rank (Strong Buy) stocks here. Over the last 60 days, Lazard witnessed an upward earnings estimate revision of 5.2% for the current year. Its share price has increased 8% in the last 12 months. Comerica’s earnings estimates for the current year have been revised 1.2% upward over the past 60 days. Its shares have gained 30.9% in the last 12 months. Zacks has just released a Special Report that spotlights this fast-emerging phenomenon and 6 tickers for taking advantage of it. If you don’t buy now, you may kick yourself in 2020.